Rumours of War is a site-specific performance in three parts conceived and directed by New Orleans performance artist Kathy Randels in collaboration with numerous local professional artists. An original music score for the piece is composed by Sean LaRocca. Set and costumes are designed by Shawn Hall. 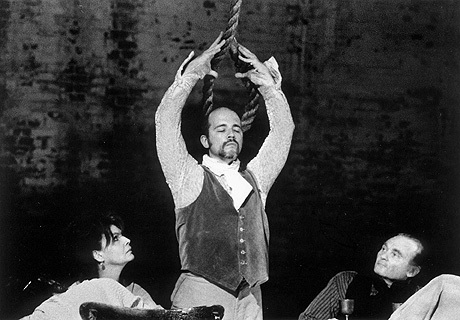 The piece, which was produced by ArtSpot Productions and The University of New Orleans Women's Center with support from the Contemporary Arts Center's Performance Support Program, premiered at the Contemporary Arts Center's performance garage October 19-28, 2001. 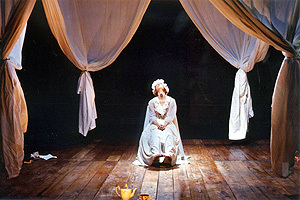 Subsequently, the piece was performed at Magdalena Pacifica, and International Festival of Women in Theatre in Cali, Colombia, in September 2002. Rumours of War is set on a Louisiana plantation at the beginning of the 19th century. In part one, War, Lucas Cox portrays a revolutionary abolitionist from the North who has come to his uncle's house for the summer with the intention of aiding in the planning and execution of a slave revolt. While there, he falls in love with his uncle's wife, the mistress of the house. The master of the house, played by John Hammons, is a general in the federal army, and has been away at the capital for several weeks. The general's son, played by J Hammons, is holding a dinner party on this evening. After the escalation of a fight between the abolitionist and the son over the mistreatment of a house slave, played by Roscoe Reddix, Jr., the abolitionist and the slave murder all of the guests at the party. As the sole survivor of the massacre, the son limps to the capital to retrieve his father. War, which is set in the dining room of the main house, explores the individual minds of those driven to fight, and the larger societal problems that provoke wars. Additional source material for this section comes from speeches of U.S. presidents and military leaders, and from oral histories of veterans and war survivors currently living in New Orleans that were collected by local public high school students involved in the Students at the Center programs at McDonogh 35 and Abramson high schools. The second part, Lullaby, takes place in a field far from the main house. One of the slaves, a high priestess of the Yoruba religion, has been asked by the gods to sacrifice her only daughter to ascertain a successful revolt. Lullaby is a danced duet for two women: renowned local dancers Ausettua Amor Amenkum and Monique Moss. 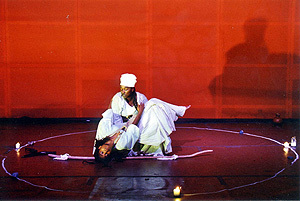 Ms. Amenkum's extensive knowledge of and skills in traditional African Dance and Ms. Moss' excellence in modern dance forms are contrasted in this piece to reveal the battle between generations, between tradition and progress, and ultimately how the individual's relationship to God has been a source of violence towards fellow man since the beginning of human existence. The legend of the dance by a Voodoun Priestess that sparked the Haitian Revolution in the late 18th century is one of the inspirations for this piece, as well as: the story of Abraham and Isaac from the Bible; Beloved, by Toni Morrison; and Fear and Trembling, by Søren Keirkegaard. In part three, The White Woman of the West, Kathy Randels portrays the mistress of the plantation, who is on her deathbed. This section plays out the war within the body of a woman infected with cancer. Randels began creating this piece in June 1999. 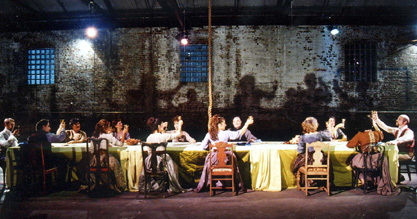 Initial excerpts were performed at The Breeding Ground, an international festival for women in performance in Cardiff, Wales in October 1999, that focused on the role of the artist during wartime. The character's race symbolizes her position of privilege in a capitalist society that exploits land and labor inside and outside its borders. She enjoys her privilege, knowing that others have died and continue to die for it. She is also the most intimate victim of her husband's brutality. This dichotomy-this contradiction-is the heart of her cancer. The audience witnesses her as she nears death. The text for The White Woman of the West is written by Kathy Randels. The entire piece has been in process since October 2000 with support from the Leanne Knot Violence Against Women Prevention Project and grants from the Louisiana State Arts Council through the Louisiana Division of the Arts and the National Endowment for the Arts and The Fund for U.S. Artists at International Festivals and Exhibitions.